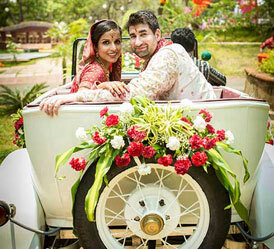 Udaipur Aditi and Matt met almost a decade ago in University in the US. Here, Aditi writes about planning a long distance wedding, which included pre-wedding functions and a Vedic and Western Wedding in the city of lakes. Matt and I met around 10 years ago at the University of San Diego when we were both attending Graduate Business School. I was the Vice President of Social Events so I would arrange introductions for newcomers and social hours thereafter. I met Matt as a newcomer to the graduate program and he instantly made his mark on me. We became very good friends. After Grad school, I left to go back home to Dubai but four years later, I returned to San Diego on holiday and unexpectedly bumped into Matt in the lobby of my hotel. We hung out together that afternoon and made plans to head to San Francisco for the weekend. When we reached San Francisco he treated me to champagne and dinner, and that was it. We fell in love. The timing was perfect for both. It was as though our love was in the making since the day we first met, because neither one of us imagined that we would fall in love and get married one day. My grandfather, Ustad Ali Akbar Khan and my grandmother Rajdhulari Khan were court musicians to the Maharaj of Jodhpur. They both fell in love in Jodhpur, and there is nothing in the world that I feel was stronger than their love for each other, it stretched over oceans and time. Also, my sister got married at the Umaid Bhavan about seven years ago and it was magical. Likewise, Matt and I wanted a place where close family members celebrated their love- Rajasthan, but we also wanted to be close to the water. So we promptly finalized on Udaipur as no other venue in Rajasthan has lakes as beautiful as Pichola. - The people at the property: When you have a wedding it is stressful in itself, hence we wanted to deal with people who are patient and flexible. - The views: If you are going to have an event in Udaipur, you should be able to relish in the city's beauty while celebrating. - The location in terms of ease of access: All guests may be unable to climb a set of stairs or walk up a hill so their comfort is the key. These are historical structures so it is important to make sure it is easy for guests who need an elevator or a ride up the hill. With these factors in mind and post our site visits, we decided to host our Sagai at Trident Hotel, Sangeet at Zenana Mahal, Vedic Wedding ceremony at Jagmandir Island Palace and Western Wedding at Fateh Garh Resort. All our venues had wonderful people managing each event and they made all our requests happen as best as they could. We didn't hire a Wedding Planner, we worked with different specialists like a wedding decor company, and roped in wedding co-ordinators later. I was my own wedding planner because I am very particular and I knew exactly what I wanted. But none of it would have happened without the support, patience and love of my parents. My mother planned and managed everything needed for each evening, right from the Panditji to personal guest invitations, ceremonial needs, menus, invitations designs, thank you notes, gifts and most importantly managing me. She was there to fill each event with the essentials and meaning while I managed the shell. My father developed the relationships with the hotels and managed the guest accommodations. Also, I had the help of my aunt, Aneesa from Avanti Arts in coordinating with the other vendors in India. We had the extra bonus of the groom and his family having never been to India and that added to the fun. My favorite part of wedding planning was the Sangeet dance practices and planning with my sisters. The most stressful part is trying to stay within your budget and also coordinating between different time zones as well as the different cultures of time and response management. Every girl wants a fairytale wedding and every Indian Wedding must include a Sagai, Sangeet/Mehndi, Haldi and Shaadi. However, as Matt and I are a combination of East meets West, we also added a function for his family to feel familiar with- a Western Wedding. I found Frozen Apple Events and instantly fell in love with their keen interest in our wedding. They felt more like family and sincerely cared about what we were envisioning. Frozen Apple Events took every picture, every theme, every item on our wishlist and make it a reality. The Sagai Event had a traditional Rajasthani lounge theme of Surai and lanterns with colors of orange and blues. We also included Signature Mocktails which were non-alcoholic beverages that mimicked the bride and groom's favorite cocktails. The Sangeet night was like walking into a wonderland of forest with trees and clouds adorned in crystals and water decorated with floating LED lotus. The colors were blue, lavender and silver for the evening. We had a very elegant photobooth with funny placards, props and of course our wedding monogram. The food had a mix of Indian and American cuisine. We wanted to make sure to honour American Thanksgiving holiday with roast turkey, honey baked ham, cranberry sauce and mash potatoes as it was on that same day. For the Indian wedding ceremony, I selected a theme that brought out traditional Rajasthan glitz and glamor all while preserving the traditional feel of a Vedic Wedding with red and gold as the theme colors of the evening. The entrance was an elephant sculptured archway in ivory. The mandap was set up with a dome of roses with red velvet and gold seating for family on the stage. The aisle was gold pillars with gold fabric down a red carpet. The food was mostly traditional Indian food with live jalebi deserts and popular Rajasthani mutton dishes. The theme for our Western wedding needed to feel like something out of a 1940's movie as the elegance and charm of a vintage wedding is something I always imagined for myself if I was to walk down the aisle in such a setting. The decor colors were mint green, pale pink and gold. The aisle was a stretch of fabric with our monogram and hanging flower pots of those pink and ivory plants. All my costume jewellery was from Silver Plaza in Mumbai. It's a gem of a place with the most wonderful of people to help you. Yogesh from Silver Plaza was my go-to man because he understood my taste and showed me only what I would love. Both Matt and I got our jewellery from there. Most of my outfits were designed by the King of Indian fashion, at least in my eyes- Sabyasachi Mukerji. His designs are the quintessence of all the visions I had for myself- a fusion of vintage with Indian tradition. I did waiver with my Sangeet outfit as that needed to be the night of glitz and glamour so I selected a gorgeous design by Dars Couture, Mumbai. My advice for to-be-weds: "Enjoy every minute of the stress, the late hours, the creative planning and meeting new people who are going make your dream come true- your wedding makers." I would highly recommend the people I worked with for my wedding simply because they have ended up becoming my friends and they made every evening magical. I did a lot of research on who I wanted for Makeup, Photography/Videography, Decor, Entertainment and Logistics. I researched the top notch guys within Udaipur and in the surrounding areas. I ended up with my first choices and the reason I picked them was because of how well they jelled with me and/or my family members. - Sahil Thakur at Frozen Apple Events and his entire team are fabulous. They understood what we wanted, responded promptly and with thorough proposals. The execution of the decor by Frozen Apple Events for each event was perfect! I walked in every evening and it took my breath away because I could not believe that it was my own wedding event! They even placed additional decor items that we would never have thought of because at the end of the day they are the experts. Sahil was there with me every step of the way which gave me all the reassurance I needed. His team went above and beyond their call of duty to make our wedding a celebration of a lifetime. I could not have chosen a better person/ company to make it all a reality! - Vikram Soni and his dance troupe were phenomenal. They had every guest spellbound with their costumes, energy and choreography, which were all absolutely amazing. - Photography/Videography credits go to The Wedding Story and my personal favorite the Director, Harpreet Bachher from Mumbai. The photos and the wedding video created by them is the embodiment of every emotion at every function. They have managed to capture all our lifelong memories in a wonderful short film. - DJ Kavish: He took our playlist requests but learned the crowd and the moods to make every evening of dancing more energetic and fun. Kavish put the last bits of tying all of the decor and moods together with the playlists I provided for our ceremonies and Sangeet performances. - Siddharth of Megasound did a phenomal job with the lighting and sound. We felt like movie stars walking into every event. Most importantly, Siddharth was easy to talk to and any requests we made, he tried to find a solution quickly. - Oozy-M took care of a lot of things with guest management, logistics and managing the wedding party's last minute needs every day during the three day celebrations. - Special credits to my magician of a makeup artist who made me look fresh and radiant despite many late nights and exhaustion. Mickey Contractor, you are the best!